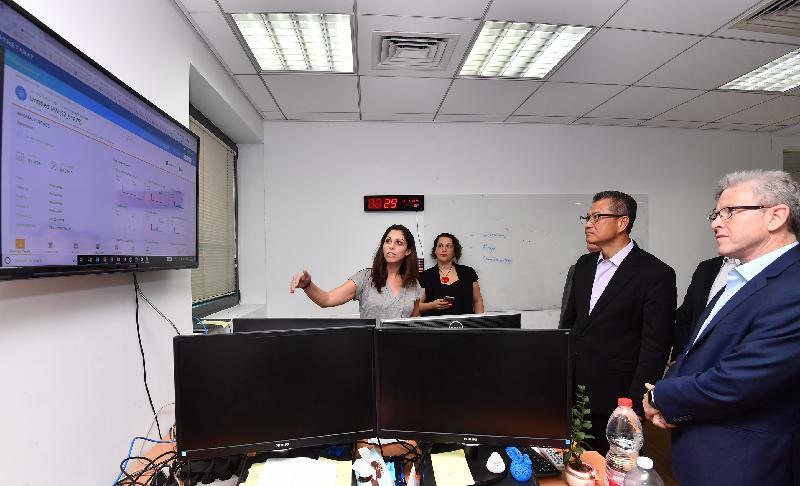 The Financial Secretary, Mr Paul Chan, yesterday (September 5, Israel time) continued his visit to Israel in Tel Aviv, where he met with top officials of the Israeli government and representatives of the business sector, to further promote closer collaboration between Hong Kong and Israel on the innovation and technology (I&T) and economic fronts. 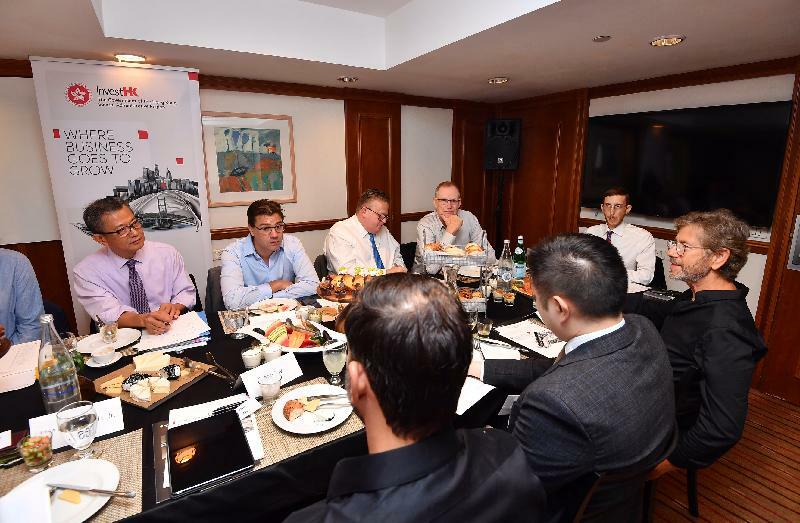 To start the day, he attended a breakfast meeting with a number of Israeli I&T, Fintech and biotech enterprises, whose business scope ranges from blockchain technology, pharmaceuticals, electronic payment to artificial intelligence. 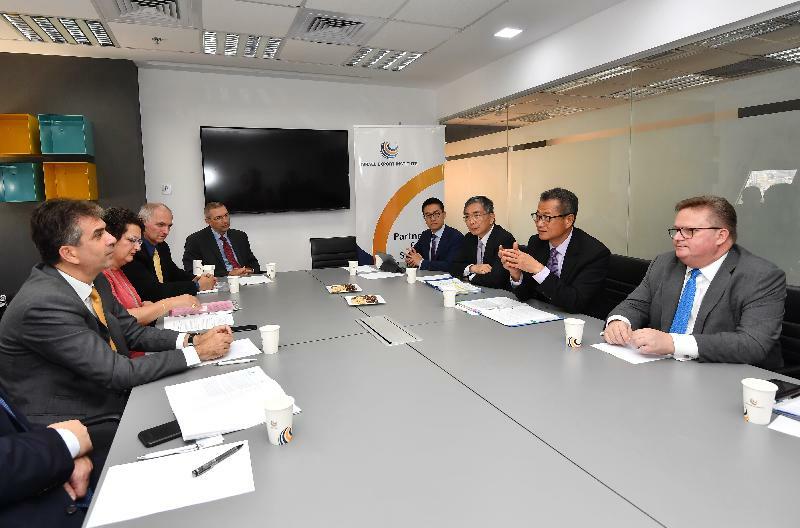 Also present were the Secretary for Financial Services and the Treasury, Mr James Lau, and the Director-General of Investment Promotion, Mr Stephen Phillips. Mr Chan highlighted Hong Kong's commitment to provide a conducive ecosystem to support I&T development, and that various measures, ranging from technological research infrastructure to pooling technology talent and provision of investment funding, have been launched. He encouraged Israeli I&T companies to establish a presence or expand their businesses in Hong Kong. Accompanied by Mr Lau and Mr Phillips, Mr Chan then called on the Minister of Economy and Industry of Israel, Mr Eli Cohen. 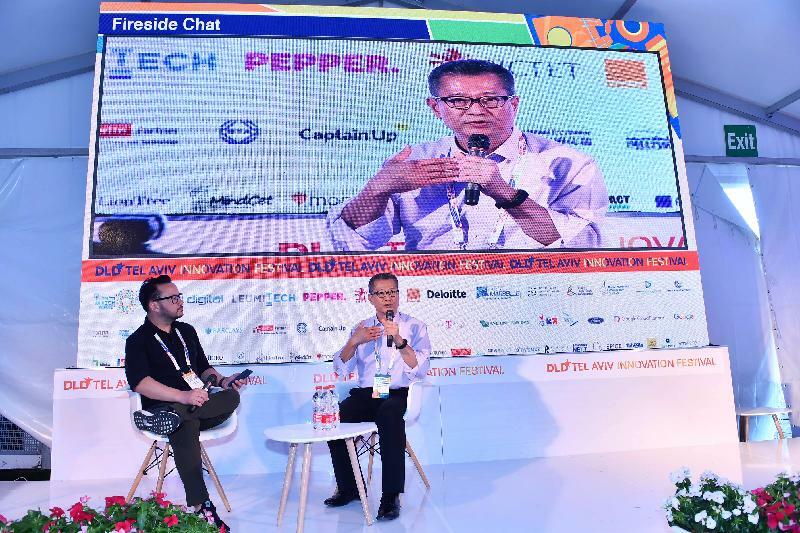 He said that Israel is a hub of advanced I&T industries with a vibrant ecosystem for start-ups, while Hong Kong is a leading global financial centre with ample liquidity and international investors. Israeli companies can make good use of Hong Kong's platform in seeking financing and suitable partners. 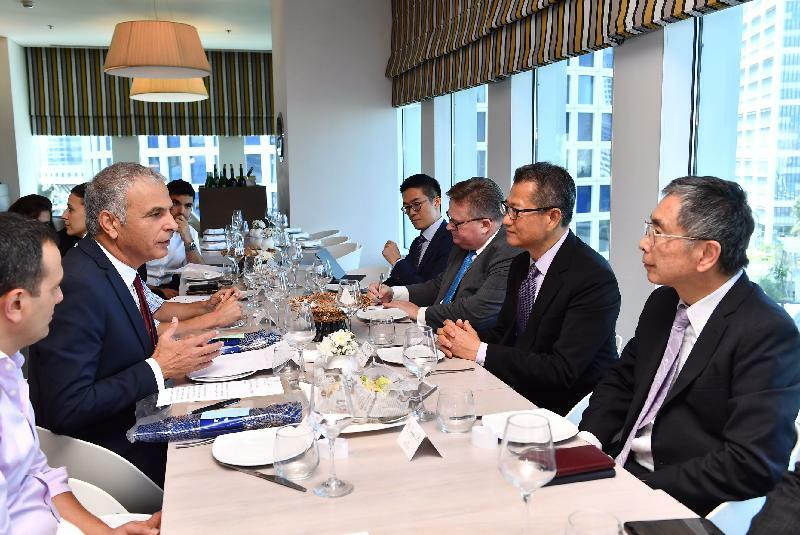 They then had a lunch meeting with the Minister of Finance, Mr Moshe Kahlon, and exchanged view with regarding the latest economic development in Israel and Hong Kong, and the global economic outlook. 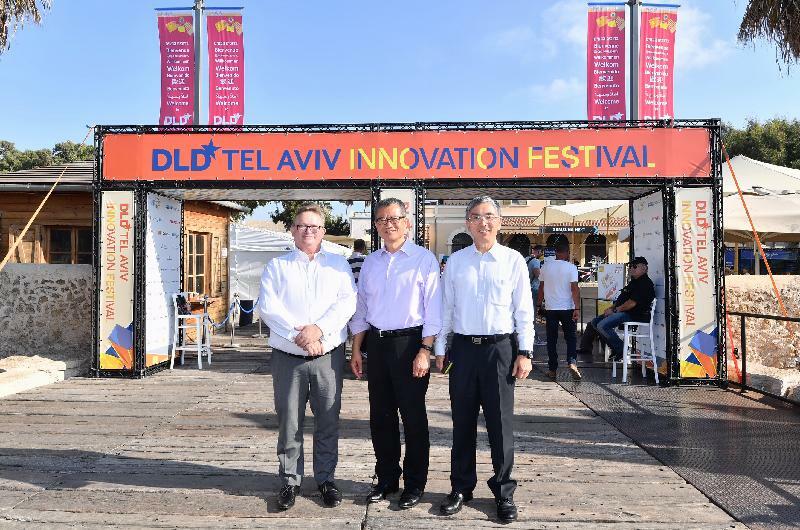 In the afternoon, following meetings with a number of Israeli companies, they visited the DLD Tel Aviv Innovation Festival. Held annually, the Festival is the largest of its kind in Israel and attracts several thousand I&T participants from around the world. At one of the discussion sessions of the Festival, he introduced to the audience the unique strengths of Hong Kong under the "one country, two systems" as well as the city's excellent business environment. Mr Chan and Mr Lau later visited a Fintech company specialises in big data analytics and cyber security. Later, they paid a courtesy call to the Chinese Ambassador to Israel, Mr Zhan Yongxin. Today (September 6, Israel Time), Mr Chan will visit Ramot at Tel Aviv University, a centre for commercialisation of the university's research work, for a briefing by academics on the latest development in areas such as Fintech and Smart City. Concluding the visit to Israel, He will return to Hong Kong in the morning of September 7 (Hong Kong time).